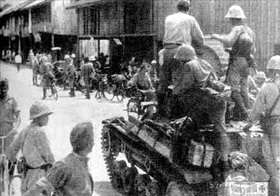 The mineral- and oil-rich Dutch East Indies (today’s Indo­nesia) was Japan’s next colo­nial tar­get in the Pacific Theater—this after Allied resis­tance had col­lapsed in the British Crown colony of Sin­ga­pore (Febru­ary 15, 1942) and all but did so in the U.S. Philip­pines with Gen. Douglas Mac­Arthur’s forces holed up on the rocky, jungle-covered Bataan Penin­sula opposite Manila, the Philip­pine capital. Darwin in North­ern Aus­tra­lia, an Allied supply and naval base that had the poten­tial of sup­porting opera­tions in the East Indies, was ren­dered use­less on Febru­ary 19, 1942, by two Japa­nese air raids, one launched from the same carrier decks that brought horrific devas­ta­tion to the Amer­i­can fleet and army facil­i­ties at Pearl Harbor, Hawaii, only ten weeks earlier, the other from land-based planes flying out of Ken­dari on the Dutch East Indies island of Celebes (modern name, Sulawesi). A hastily assembled multi­na­tional flotilla of American, British, Dutch, and Aus­tra­lian (ABDA) war­ships, many of World War I vin­tage, con­fronted a supe­rior Japa­nese invas­ion force com­prising one light air­craft carrier, two heavy cruisers, two light cruisers, four­teen de­stroyers, and ten trans­ports. In the seven-hour, on-and-off Battle of the Java Sea on Febru­ary 27, 1942, the Allies lost two heavy cruis­ers, three destroyers, and 2,300 men, including 52‑year-old Rear Adm. Karel Doorman, ABDA Strike Force com­man­der, when his light cruiser and flag­ship HNLMS De Ruyter went down. The Japa­nese, suffering damage to one destroyer and the loss of four trans­ports, succeeded in landing an invasion force on the popu­lous island of Java, site of the colony’s capital, on February 28. 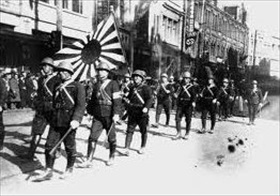 Japan’s decisive naval victory and follow-up en­gage­ments over the next two days accele­rated its con­quest of the Dutch East Indies, whose civil­ian admin­is­tra­tion sur­ren­dered uncon­di­tionally on this date in 1942. In the week­long land cam­paign Dutch troops, aided by British and Amer­i­can rem­nants, fought fiercely, and when it was over the Japa­nese exe­cuted many cap­tured Allied sol­diers and sympa­thizing Indo­ne­sians. Not until later in the year would Japan’s air and naval superiority in the Pacific be tested again. Two naval en­coun­ters in the Coral Sea (May 4–8, 1942) and at the Battle of Midway (June 4–7, 1942) restored the balance of power in the Paci­fic that had been lost at Pearl Harbor on Decem­ber 7, 1941. Over the next two years, U.S. naval and air power relent­lessly chewed up Japan’s over­seas empire. When the war came to an end, the former Dutch colony uni­lat­erally declared its inde­pen­dence, and the Repub­lic of Indo­ne­sia was born on August 17, 1945, in a simple flag-raising ceremony in Jakarta. Above: Map of Japanese assault on the Dutch (or Netherlands) East Indies and Darwin, Australia, January–February 1942. 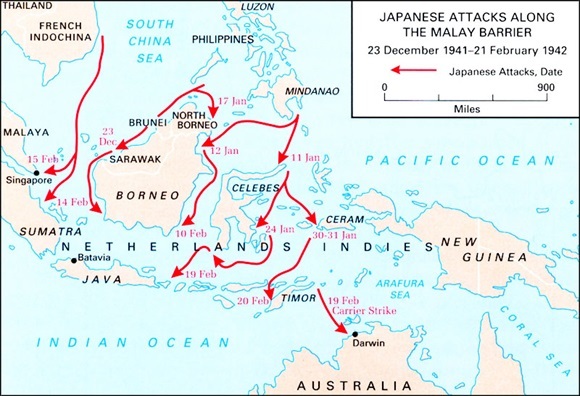 The “Malay Barrier” in the legend (aka “East Indies Barrier”) refers to a notional chain of defenses across South­east Asia and the Paci­fic that the Japa­nese breached in early 1942 by capturing the rubber-and-tin-rich Malayan Penin­sula and Singa­pore (both British depend­encies) and the rich oil fields of Dutch East Indies and Borneo. When the Dutch-held island of Java fell on March 8, 1942, it opened up the Indian Ocean to the Japanese Navy. Right: Following navy tradition, Adm. Doorman chose to go down with his ship early on the morning of February 28, 1942. Above: Initially Indonesians wel­comed the Japa­nese as libera­tors and were im­pressed by Japa­nese pro­pa­ganda that stressed Asian sol­i­dar­ity against Euro­pean colo­nial regimes—slo­gans like “Japan—Light of Asia” and the radio roll­out of Japan’s “Greater East Asia Co-Pros­pe­rity Sphere” in June 1940. Soon, how­ever, the Japa­nese im­posed an oppres­sive occu­pa­tion. They ex­ploited the islands’ fuel sources (pri­marily oil, which the Dutch had cut off the year before), cut down large tracts of forests to plant cash crops for ex­port back to the Home Islands, and forced all able-bodied males to pro­vide free labor for their war effort (romusha labor pro­gram). Hun­dreds of thou­sands were sent over­seas to work on the con­struc­tion of the Thai-Burma rail­way and Japanese projects elsewhere in Southeast Asia.